Television, print, and online journalism was honored for accuracy in mental health reporting at the Heinz HistoryCenter ceremony, produced by Entertainment Industries Council, Inc.
PITTSBURGH, PA (October 24, 2013) ‐ Southwestern Pennsylvania media is leading the movement for building healthier communities through authentic and inspiring journalism. This year, nearly 60 informative stories of hope and perseverance were submitted. 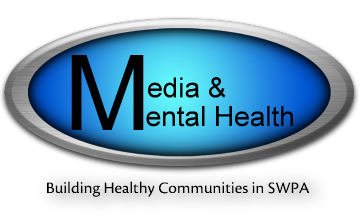 The annual SWPAMedia & Mental Health Awards, produced by the Entertainment Industries Council, Inc. (EIC) in collaboration with The Staunton Farm Foundation, honored the works of media professionals who accurately report on mental and behavioral health issues within television, radio, print and online media in Southwestern Pennsylvania. The ceremony, with keynote speaker and respected lawyer, author and activist, Brian Cuban, and featured speakers Congressman Ron Klink (fmr. ), Director of Communications of People for Pedudo Sonya Toler, FosterHyland and Assoc. Principal Sheila Hyland, WTAE News Anchor/Sports Director Andrew Stockey, and retired KQV broadcaster Frank Gottlieb took place tonight at the Senator John Heinz History Center in Pittsburgh. “We are elevating the national conversation on behavioral and mental health through authentic reporting in local news media. This SWPA movement will serve as a national model that can be replicated in other communities across the country,” said Brian Dyak, President & CEO of the Entertainment Industries Council, Inc.
“We appreciate the talent of reporters who value accuracy, craft stories that inform, make us think, and move our hearts, ” Dyak concluded. EIC, a non‐profit organization, was founded in 1983 by leaders of the entertainment industry to bring the power of the industry to communication about health and social issues. The organization is considered to be the chief pioneer of entertainment advocacy outreach and one of the premiere success stories in the field of entertainment education and information resources for entertainment creators, through innovative and time‐proven services and methods of “encouraging the art of making a difference” from within the entertainment industry. EIC also produces the simulcast national television special PRISM Awards Showcase which addresses accurate portrayals of substance abuse and mental illness: prevention treatment and recovery. EIC’s web site is www.eiconline.org. The PRISM Awards web site is www.prismawards.com.